In this truffle recipe tangy lemon joins forces with fragrant white chocolate, defining the meaning of smooth and refreshing decadence! These truffles are very soft and therefore should be handled gently. Although we have yet to test this theory, you may want to try adding about 1/2 teaspoon of baking soda to the chocolate mixture to help develop a firmer truffle, this will remove an excess moisture and help thicken the chocolate without imparting any flavor (UPDATE: we used this method in the Thai Tea Fudge). In a small saucepan (non-aluminum) combine the heavy cream and lemon zest. Over low heat bring cream to a simmer, stirring occasionally. Remove from the heat, cover and let sit for 20 minutes. In a double boiler, or medium heatproof bowl, combine the white chocolate, salt and butter. Set aside. Remove the cover from the cream and lemon zest, reheat over low heat, stirring occasionally, until it reaches a simmer. Remove from the heat and strain through a fine-meshed strainer into the white chocolate mixture. Press down on the lemon zest in the strainer to extract all the liquid. Place white chocolate mixture on your double boiler over low heat, make sure the bottom of the bowl is not touching the water. (Or if you are using a medium bowl, place over a pot of warm water on low heat, still making sure the bottom of the bowl does not touch the water.) Stir frequently just until almost melted. Remove the bowl from the warm pot and stir until the chocolate is melted and smooth. Once combined and smooth transfer the mixture to a small bowl or plastic container and chill in refrigerator for at least 4 hours, covering tightly with lid or plastic wrap. To make truffles: Using a small cookie scoop or a spoon, form balls of about 1 inch in diameter from the cold white chocolate mixture. Roll in sugar until well-coated. Store truffles airtight in refrigerator for up to one week or freeze for longer storage. To serve, remove from refrigerator and let sit for 15 to 20 minutes before serving. 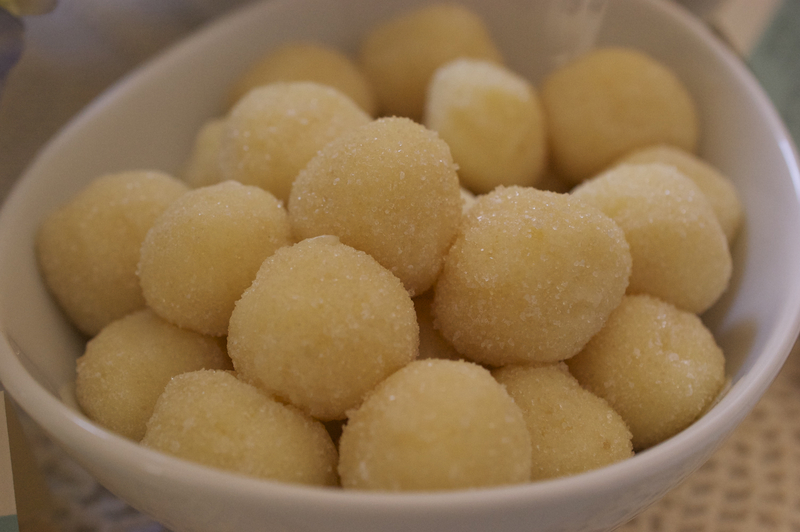 If you are having trouble rolling truffles, drop the small spoonful of white chocolate mixture into the sugar. And use the sugar to help roll the truffle into a ball. Once a ball is formed, re-roll it in the sugar until coated. You can roll these truffles in about anything you like: granulated sugar, lemon sugar, confection sugar, or even nuts!